ACADEMY AWARD® Winners Reese Witherspoon* and Christoph Waltz** join Robert Pattinson (The Twilight Saga) for this epic tale of forbidden love based on Sara Gruen’s acclaimed best seller. Against all odds, a veterinary student (Pattinson) and a beautiful circus performer from a bygone era (Witherspoon), meet and fall in love through their shared compassion for a special elephant. But their secret romance incurs the wrath of her dangerously volatile husband (Waltz). The book is better than the movie. The book has well developed characters. It's also has a rich, well developed, story line.. You feel the atmosphere and the grittiness of circus life. You get to know and feel about the characters in the story; beyond the main characters. . In the book, Marlena wasn't portrayed as some flirtatious vamp. Jacob was an innocent, but strong young man thrown into the circus by life circumstances, and you really get to know August as the truly sadistic person he was. Uncle Al, the owner of the circus was cut out all together. Yes, you get to see some of the sadistic traits of August, but in watching the movie, you can kind of feel for the guy, too. It's not like he imagined his wife and Jacob's attraction. Marlena and Jacob were very obviously attracted to each other, and they were obvious about it. Marlena was flirtatious with Jacob. Their sexual attraction was there almost from the beginning. What man would be happy about his wife's flirtation with his employee and his employee's mutual attraction towards her? Sadistic though he was, I still could understand his anger at the situation. The situation actually gave some credibility to his anger...extreme though it was. His inability to express his feelings led to a lot of cat and mouse games between the characters. I didn't enjoy that. It lent an unnecessary darkness to this movie. The book was gritty and real, but not dark. The movie wants to convince us that August is a sick, sub human being, and that's a lot of the focus of this movie, but it's wasn't firmly convincing, because of the way they chose to portray his wife's character and focus on her relationship with Jacob. In the book, there was much more to Jacob's character than his interactions with August and Marlena. Marlena wasn't sending out mixed messages. Marlena wasn't a mixed up victim that needed to be saved by Jacob. She chose her life with August, had enough, and she just made a different choice for herself with Jacob, and you get it was her choice. In the book, Marlena was a stabilizer for August, until she had enough. Jacob was attracted to her from the start. Marlena was not. She came to know Jacob and then she came to love him. August was a sicko and there was no doubt about it. He was crazy way before Jacob came on the scene. You get this clearly. There is no conflict in the reader's emotions. His craziness was not jealously driven or really even directed towards Marlena, until he feared losing her. She was his savior, until she chose not to be. When August gets his due. You want to clap. In the book, you come to know and love Camel, Walter, Rosie, and you really get to know Jacob. You get a feel for the solidarity of the roustabouts and sub performers in the extremely hard working conditions, and the toughness of the people of that time period. You get a real feel of the class distinctions within circus life. All that said, the movie is well acted. The average review is for the script, not the acting. This is not a true representation of the book at all. Water for Elephants is so much more than some damsel in distress love story, and her dark, creepy circus guy husband. If you like to read, get the book. You'll be drawn in and enjoy it. The books is so much richer. 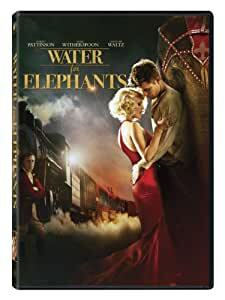 A circus traveling the country by train during the Depression is the setting of WATER FOR ELEPHANTS. It is a visually appealing period piece that seems to lose a lot in the story. The circus is owned by a sociopathic and murderous August (played with relish by the delightful Christoph Waltz). His gorgeous young wife Marlena (Reese Witherspoon) is the circus' star performer. Enter the dashingly handsome and noble Jacob (Robert Pattinson) and well...you can guess the rest. 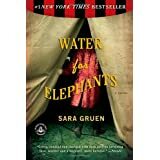 WATER FOR ELEPHANTS can be an unnerving view for animal lovers. There is a great deal of animal abuse and even if it is simulated, it feels real. Of course, that is part of the story and life in a circus at the time was no joy for animals or humans. The story is dark and violent and follows a storyline seen in so many films. There is not much original about the film except for possibly the setting. Lovely Reese Witherspoon looks as she has been airbrushed of all wrinkles. Her porcelain skin looks painted on and I wondered if this was an attempt to make her character appear much younger than Witherspoon's actual age. She's a beautiful lady so the unusually smooth skin looked impossibly odd. Two highpoints are Rosie the aging but agile elephant and the venerable Hal Holbrook as the very aged Jacob telling his story to a young circus worker. Not a terrible movie but more disappointing than it should be. One of my all time favorite movies, even if it’s not exactly following the plot of the book. If you’ve read the book you may be slightly wanting more, but if you’re new to the story of Jacob Jankowski and his time with the Benzini Brothers Circus, you’ll fall in love with the film’s imagery. In my opinion, Waltz steals the show...the chemistry between Witherspoon and Pattinson isn’t always there, but you do feel a connection. I do, however, recommend the book over the film—wish they’d done more to bring Gruen’s novel and characters to life. 4.0 out of 5 starsELEPHANTS REMEMBER! Entertaining and colorful, this is a pleasant film to watch. The cast does a nice job; Reese Witherspoon displays great athletic prowess and she is a delight to watch. The story's underlying tone of impending disaster provides a negative aura to this tale: it is worth watching to see how it plays out. From a historic perspective, this film portrays the difficult life experienced by those in the circus world at that time. Pretty violent and hard to watch because of the animal cruelty portrayed. I cried and had to shut my eyes. It seems like a hopeful movie but for the most part it’s tramatizing there is also abuse of people. Movie follows the book fairly well, but leaves out a secondary character that's pivotal to understanding part of the movie at the end. This is an excellent book to listen to in audio format when you're on a long trip, by the way, just know that the movie left out a lot of graphic sexual content that's included in the book. Was reading the book when someone reminded me there was a movie. The movie's cinematography is beautiful, think the look of Polar Express. I am glad I read the book first, Ms. Gruen is such a great story teller and several key parts of the book were omitted or changed. Reese Witherspoon was great as usual. Pretty awful movie... and I'm easy to please! The book is so much better and very different. I've watched the movie twice (giving it a second chance) and it still doesn't get better. It feels like there is so much detail in the book and the movie rushes through it for the sake of showing the love story.